Talking of Climate Models, there is another great Climate Audit post titled "Unprecedented" Model Discrepancy where Richard Betts, once again, provides cartoon inspiration in the comments. It’s a bit like watching a ball bouncing down a rocky hillside. You can predict some aspects of it behaviour but not others. You can predict it will generally go downhill, and if you see a big rock in it’s path you can be reasonably confident that it will hit it and bounce off, but you can’t predict the size and direction of all the little bounces in between. Richard's never found the time or space to explain why his bouncing pooh stick balls argument applies to time but not to space, or away from poetry, why regions of the globe would be warming in a predictable manner especially if very small. Yep that's what I'd expect if I predicted a bouncy ball would go down hill. Nice simple physics, the Law of Gravity, it will go down hill and keep going until it comes to rest, which might be in a hole in the hill or behind an obstacle it cannot negotiate. So you see Richard even in this extra simple analogy you can't predict the final position of the ball, which you're doing for climate with the climate models albeit with huge (and unremarked in the IPCC SPMs) uncertainties. Not only that there are only really two laws of physics involved in your analogy, Gravity and Newtons Laws of Motion. I'm not sure I know all the physics, chemistry and biology that goes into building a birds entrail that can foretell the future, but I suspect it's a smidgeon more than the bouncing ball down hill. I've used this one using a rubber ball down a flight of stairs ( which I think is better). It's a good example of how some things can be generally predictable but not precisely predictable. It is the case that this analogy fits somewhat with climate models, but the reason it does is that the assumptions of all the GCMs build in the CO2/temp relationship which they are presumed to be illustrating. The downslope of the hill/stairs is the equivalent of that assumption. But the model can't be used to prove the relationship that way. The model only says IF we have the right CO2/temp relationship we have a model which will show the temp rise over time superimposed over natural variations. The actual CO2/temp relationship is shown by comparing model output to reality. That comparison shows the model isn't right. The rock doesn't roll. The ball stopped on the middle step and we are expecting it to start bouncing again. That is the lesson we should learn from this analogy. @omnologist: Someone, I can't remember who, asked Richard where the proof of fossil fuelled CO2 was the main cause of climate change lay. His response was to point her at AR5 WG1 a 1500 page document that took scientists 5 years to prepare. Sometimes you have to wonder. Here's a message I want to deliver to the embattled cliscis, you cannot foretell the future, it's that simple No matter that you've all got brains as big as planets (which I doubt, but some of you have), no matter that you have more than a passing grip on the science of the climate, paleontology or physics, you cannot foretell the future. That you have people and politicians who believe you can, you can't, and as I've discussed with Richard before, if he could do that he and I should get together and model next year's Grand National and make a killing rather than our both wasting time worrying about climate. So please Richard, stop pretending there is the remotest skill in the models for predicting climate and weather conditions 20/30/40/100 years into the future, and 'fess up to the politicos that it's impossible. rhoda: Actually the hidden assumption in Richard's analogy is that the hill is the equivalent of a set of stairs and that come what may the ball will reach the bottom. What his analogy is trying to do is to explain away the hiatus and the fact that the models show no real skill over any sort of time i.e. there forecasts are wildly out. I guess he's hoping that we see the wildly wrong forecasts as the ball bouncing back up the hill to explain the failure of the models. If I was the boss I'd be asking them to go back and find out why the models are so far off from reality rather than making up analogies that don't bear scrutiny. … and if it is an inflated ball, it might just burst and come to a standstill. It is more like a gentle slope than a hill and perhaps The Mysterious Roving Rocks of Racetrack Playa is a more apt analogy. They pulled out small levels to determine if the rocks might be moving along trails tilted ever-so-slightly downhill. Instead, "the general trend is that they move uphill," as reported by Andrew Ryan of Slippery Rock University in Slippery Rock, Penn., in a talk that the LPSA group gave later at Goddard. "But the slope is so insignificant that we don't think it would influence this movement." The basic physics (gravity) says that the rocks should all move downhill but they don't. "It’s a bit like watching a ball bouncing down a rocky hillside. You can predict some aspects of it behaviour but not others. You can predict it will generally go downhill, and if you see a big rock in it’s path you can be reasonably confident that it will hit it and bounce off, but you can’t predict the size and direction of all the little bounces in between." Ille est - they are usless. And cost the taxpayer. "To continue with my ‘ball bouncing down the slope’ analogy above, the CMIP5 models are like a bunch of people tried to predict where the ball will land when we let it go at the top. Some made predictions over to the left, some over to the right. The group of all predictions was quite wide. Then we let the ball go, and let it go half way down the hill. It starts heading towards the left, and eventually it becomes obvious than there’s no way it’s going to match the predictions over to the very right. Someone catches the ball, and we all make new predictions. There’s still a spread, but less so because we’re now closer to the bottom of the hill so less room for random effects to make a big difference." This reminds me (painfully) of students running psychology experiments, turning up with their "almost significant" results, clutching p = 0.07 to their chest, and asking: "Can I run a few more subjects?" Richard Betts' bouncing ball analogy is little better than the greenhouse analogy. "Attacking climate scientists is wrong". and no doubt ATTP will be along to say that this is not what Betts said at all . . I completely agree that you cannot foretell the future, this is entirely my point. However, you can make estimates of future changes if the thing you are studying is following physical laws (which the climate system does, but horse races don't). Often these estimates will be very general. As you say, we know that balls go downhill and the climate warms in response to a positive radiative forcing, but given all the chaos and complexity we don't know where they will end up. Glad you like it, thanks for the rubber-ball-on-steps version, I like that too. What makes you think it's stopped on the middle step though? Just because the global mean temperature has paused/slowed/hiatused/whatever, it doesn't mean there's nothing happening at all. Increasing ocean heat content, rising sea level, and shrinking snow and ice cover are all consistent with a generally warming world overall. I've always agreed with you that uncertainties are larger at smaller spatial scales. Thanks for quoting me further. For context, I suggest readers here go to Climate Audit and see the whole discussion, especially my initial comment on observational constaints of projections. My point was that after a few years you can obviously narrow down the uncertainties to some some extent, simply because you've seen what the climate has done recently (in this case, it seems it's not following the track suggested by the very warmest models). Nothing wrong with learning from experience! Geronimo "No matter that you've all got brains as big as planets (which I doubt, but some of you have)" Gas Giants? Replace the ball with a balloon and add a teeny weeny bit of wind. PS: The justification for switching the ball for a balloon is to represent the vanishingly small contribution of CO2 to the atmosphere that is anthropogenic. I don't think the chaos of the wind requires explanation. Bish, you are missing a .uk on the link to Josh's site. Surely the bouncing ball analogy only works if it's bouncing UP a hill. How high does it get before settling on a hollow "step" or log for the dendrochronologists ? We've thrown it afterall? I'm willing to bet(t) that horse racing does follow physical laws. I think what you're trying to say Richard is that the variables involved in horseracing are too complex to predict with exactitude. You can look at 'form' and make predictions from that, and more successfully if you have additional knowledge (state of the course, what the jockey had for breakfast etc. etc.). In climate modelling you know broadly what the main parameters are but there are a multitude of other variables that have an effect but exactly how and to what degree we don't know. To quote your later comment: "you can obviously narrow down the uncertainties to some some extent, simply because you've seen what the climate has done recently", i.e. it's 'form'. I'm struggling to see the difference between climate science and horse racing. The problem as I see it is that the higher sensitivity models, or a combination of models including them, are still being used for decision making despite the growing divergence from the observations. This is how Kevin Henderson got himself in a pickle. He built a model on a model. And the model he chose said that temperatures we higher than the observations. If you are saying you are pretty sure the observations will catch up then fine, say that explicitly with a target date for the observations to get back on track. And the mechanisms that will cause the sharp upslope needed. If you don't think the observations will start to track the models it is probably a good time to say publicly that some of the models are cannot be relied on and stop giving them credibility. The horse race is far more predictable than the climate, since the rules are well known, the participants have form, the objective is clear and its conclusion is a fixed point. Yet remarkably nobody is surprised when people lose money betting on them. Strange, that. Bluntly Richard Betts - I don't think you have a clue. The impression that comes across to me whenever the "Climate In Crowd" discuss models and their evaluation, is that they have no solid methodology for either their development or evaluation. Time and again the responses to questions are just arm waving generalities and make-it-up-as-you-go-along methodologies. Apologists offer "well the only valid evaluation metric is the perception of the user and they feel they are good enough for their intended purpose". Well taking that at face value, IMO the "user" is society at large who grant policy makers a remit to make decisions in their best interests. As a member of society who sees the level of misdirection of resource which climate models are responsible for, I can only say I judge them as totally inadequate for purpose. A load of bouncing balls indeed. In climate science, when observations don't match the science, it is obviously the observer who is wrong. Anyone who disgrees, is obviously a Big Oil funded denier, and must be shunned and ridiculed. We model the ball as bouncing downhill (eventually) because all our observations show that gravity works. But it needn't work like we expect. Imagine if the cliff was in an accelerating spaceship. The acceleration means the ball always bounces downhill. Then the braking thrusters kick in. The ball doesn't go down at all. Gravity has stopped! No model would expect that. We have only one climate. In the 20thC we have had rising CO2 levels and we have had rising Temperatures. And if we assume the correlation is a causation (although they don't correlate but - smeared out with lags and squint a bit...) Then we get models that keep on going up. But we actually have only one observation. One planet sailing through space. (No. The models are not observations). So we could be in for a surprise. And certainly, anyone who thought that AGW was newsworthy, has been surprised. The warming stopped but the emissions didn't. You say "nothing wrong with learning from experience." Hmm... In the example I give I always tell students they can, of course, run more subjects BUT, they will move from a position where they know the results are not significant to a position where they will have no way of knowing anything! If you want to call that "learning from experience" - okay. "Statistical inference almost always improves with larger samples, which suggests that researchers using hypothesis testing will improve their conclusions by increasing sample sizes. Although unclear results should motivate scientists to gather more data and thereby reveal the truth, this idea does not work well in psychological science because the standard logic of frequentist hypothesis testing is valid only when the sample size is fixed prior to analysing data. Despite this limitation in hypothesis testing, a common request by reviewers and editors is for authors to add more participants and see if a weak (say, p = 0.07) result might become significant. Reviewers almost never request that authors add more participants to see if data with a moderate (say, p = 0.03) result might become non-significant. Over multiple experiments, these requests, or similar “optional stopping” by authors, produce a bias that exaggerates effect sizes and replication rates of measured effects –. Gathering additional data can lead to misleading p values, because the Type I error rate increases rapidly with additional tests." What is your anchor point? Are you tied to truth seeking or have you determined the truth and are now bound to defend that determination. Betts is a great example of the latter. That's why his posts so often seem illogical and just plain goofy. Bouncing balls indeed. What about blowing bubbles? Climate scientists only play with anti-gravity balls, that don't always drop, when expected to. Increasing ocean heat content, rising sea level, and shrinking snow and ice cover are all consistent with a generally warming world overall. I fear you are now believing the headline writers, not the data. Ocean heat content - I don't think there is any reliable data on that. Arctic sea ice yes, the trend since 1979 has been in decline, but this is probably more to do with natural variability / wind transport of ice down the Fram Strait than any warming trend. And 1979 was a fortunate starting point for the contemporary datasets - 1990 IPPC graph [source: www.ipcc.ch/ipccreports/far/wg_I/ipcc_far_wg_I_full_report.pdf]. 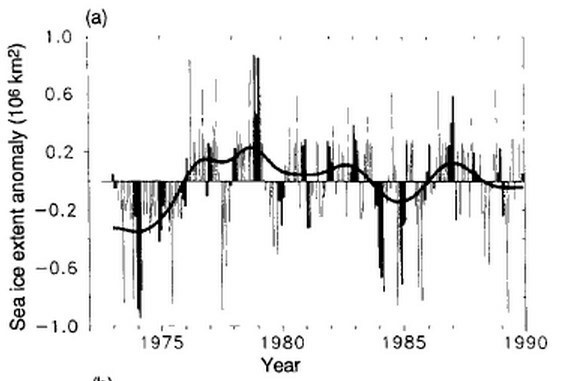 Snow and ice cover - NH snow and ice cover since 1972 So no trend there then. Antarctic sea ice extent - setting new records. Global sea ice extent - http://arctic.atmos.uiuc.edu/cryosphere/IMAGES/global.daily.ice.area.withtrend.jpg - so no trend there then. Antarctic temperatures - 1959-June 2013 not warming - [Hadcrut4 area weighted 70-90S] http://notalotofpeopleknowthat.files.wordpress.com/2013/09/image2.png - no warming trend there then (and so much for polar amplification). Extreme weather / 'climate disruption' / 'global weirding' - http://notalotofpeopleknowthat.wordpress.com/2014/02/06/storminess-of-the-little-ice-age/ so nothing unusual or unprecedented about the last few decades. Richard - all you have is a couple of decades in the late 20th Century, which were warmer than the 60s and 70s. And more to do with mild winters than any unprecedented heat. Take away dodgy station selection, homogenisation, UHI, and blatant adjustments, and the rest can easily be put down to natural variability (ocean cycles, cloud cover etc). So how does Betts analogize the tiny grains of sand (CO2) sprinkled between all those much greater/bigger rocks being the main source of the bouncing ball's erratic roll. TerryS, the rocks are no longer a mystery - they have been filmed moving, and they move 'cos of wind blowing across a thawing surface with the rocks trapped in sheets of floating ice. My worry, Rhoda, is that the GCMs are more likely programmed like a Slinky going down stairs. This is a crap analogy for the back of cereal packet. The elephant in the room, and one that Climate Science ignores is chaos. It is a chaotic system. The hill is this case, is actually moving its shape. The ball landing from a bounce might hit a depression on its ways down and energy removed. It might hit a hillock on its way up, propelling far and away in an unknown direction. And the action of the ball on the hill also causes the hill to have a different shape. You cannot predict the shape of the hill. The shape of the hill changes after you release, even if your prediction looks good at the moment of release. And the ball has an effect on the hill shape also. Billions of dollars on futile attempts at modelling a chaotic system such that climate scientists can earn a good reputation and salary? What you have is no more than a sophisticated computer game. Climate Theft Auto 97. Oh it looks good. It seems to be real. It impresses people. And you add another 100 million pounds worth of super computer to improve the frame rates and resolution. But it isn't real. It is a computer game. A good one, but that is all it is. A very limited view on reality. Richard, if that heat is really in the oceans and it is of the order of one hundredth of a degree, how in your physics (as you know I am a mere Oxfordshire housewife not very up in such things) is that heat going to heat the atmosphere by more than a hundredth of a degree without going a long way up the slope of entropy? I'll put your answer with the one about how it's so bad if Oxfordfshire has to deal with the temperature of Bordeaux? Or was it Portugal. As soon as it comes. You have the evidence on nearby dartmoor via places like medieval houndtor and bronze age grimspound, that the temperatures were warmer then than today. Even the dartmoor authority web site says so. Does that give you pause for thought that if it's all happened before at 280 ppm that perhaps that sort of concentration is about the logarithmic maximum for the effect of co2? Where is the evidence that today is unusual? In your own archives are numerous references to The extreme events of the past 1000 years, of which storms and flooding are the most notable features. Would you like to see the references I have collected, I could do with a mince pie and coffee in your canteen the next time I am at the met office library. Tonyb - same here - I recently asked a leading expert on Bornze / Iron Age Scotland what the climate was like then - the answer was 'Mediterranean'. I still hae ma doots it was that warm then, but it must have been at least 2 or 3C warmer than now for them to cultivate the crops they grew (many Bronze Age homesteads were on the hilltops and upland moors - at least 300 or 400m in altitude, and well above current arable limit in the Highlands). Have you come across this site - http://booty.org.uk/booty.weather/climate/wxevents.htm ? If not I am sure you will find it useful, much of it seems to come from Lamb's research. Sadly it looks like it may be closing down in the near future. Richard - appreciate you coming on here - obviously I don't agree much with your climate worldview but like to think that some of the things you read here may make an impression and that one day you will jump off the bandwagon. Richard, Tonyb poses an excellent question- Where is the evidence that today('s climate) is unusual? Until you can answer this basic question the models, each and every one of them, is a colossal waste of time and money. However, you can make estimates of future changes if the thing you are studying is following physical laws (which the climate system does, but horse races don't). Delusional again Richard I'm afraid. You could hardly be more wrong. The bookies (and horse racing markets) are way, way better at forecasting future horse races than you are at forecasting...well anything. Don't believe me? There are plenty of databases of horse racing data these days for you to interrogate. What you'll find is that after adjusting for the profit margin (normalise to 100%) that 9/1 shots win pretty much 10% of the time, 4/1 shots win pretty much 20% of the time, Evens shots win pretty much 50% of the time etc etc. And not a hindcast in sight. This is precisely why it is so hard to win money at horse racing - the markets have a VERY good handle on what is going to happen on average in the long run (i.e. the odds are proven correct). All in the future. Compare that to the Met Office's laughable ranged seasonal forecasts of the variety 25%, 20%, 20%, 15%, 20%. As I've explained before the fact that the ranges are so close together (3/1, 4/1, 4/1, 13/2, 4/1) is a tacit admission that you do not know what is going to happen. Why anyone takes any notice I do not know, and what actions those who do take notice are supposed to take I also don't know. In addition I have seen absolutely no evidence that your %ages have been proven to be accurate (as with the bookies odds). Can you show me that? If not the MO really should keep schtum until it can prove it. In fact what a punter really needs to have a chance of winning money is to bet on the MO forecasts rather than the horses. "In 4,000 Weather Test Bets over 12 years with William Hill, Weather Action forecasts made a profit of some 40% (£20,000). The Odds were statistically fair and set by the Met Office before being shortened by William Hill by a standard 20%; the results were then provided by the Met Office for William Hill to settle each bet. Piers Corbyn was excluded by the bookies from such account betting in 2000." As a racing man, it was stumbling across that astonishing success that first got me questioning the climate claims. The difference of course is the bookies are playing with their money so have to be right whilst you are gambling with other people's. I suggest you pop down to Exeter races and ask a bookie to teach you a thing or two about odds and forecasting. It seems to me that RB made a complete arse of his own analogy by introducing left/right motions of the ball, which have no place in it AFAICT. The purpose of the models is presumably to estimate the steepness of the slope (and how it changes in response to GHGs). The unpredictability of the 'rocks' is irrelevant - nobody is criticising the models for failing to reproduce tiny details, unless a chance arrangement of 'rocks' can create a 'pause'. If the modelled 'balls' consistently reach the bottom of the hill ahead of the real one then it is reasonable suppose that the modelled slope is too steep. This failure of the models may perhaps be explained by the relationship between climate salaries and climate sensitivity. Yes, I am well aware of that source and use it and several others, but mostly I research my own material which sometimes leads back to places like booty as there are a limited amount of primary sources, the Met office library and archives being some of the best. Yes, in the padt crops were grown at a much higher height than they are today and the tree lines were higher. I have my doubts about a Mediterranean climate though, as much of the past seems to have been filled with numerous episodes of storms and extreme flooding. The area round the met office in Exeter is especially well documented and the number of times local mills, bridges and houses were washed away is legion. "we know that balls go downhill and the climate warms in response to a positive radiative forcing"
The empirical evidence suggests nothing of the kind. The climate isn't warming, and the data suggest (to say the least) that the "radiative forcing" effect is saturated. "Increasing ocean heat content, rising sea level, and shrinking snow and ice cover are all consistent with a generally warming world overall." "Unknown ocean heat content, no trend in rising sea level and growing snow and ice cover are all consistent with a generally cooling world overall." "it seems it's not following the track suggested by the very warmest models"
"it seems it's not following the track suggested by most of the models"
I'm with nby. RB doesn't have a clue. The rolling rock is going downhill. (As the temperature in the models is rising). The analogy holds if the rock is now thirty feet underground, tunneling its way to the bottom of the hill. Because that's (inverted) what actuals are doing in the temp world. The model ensemble is up there and the actuals are a lot lower. Lower than almost all the runs of almost all the models. There is no model that does well. If there is, why not keep that one and chuck the rest, they are never going to be right, their rock is fifty feet underground. It is the failure of the climate kids to drop bad models that makes one think the reasons for inclusion are about politics and solidarity with the cause. Why not chuck out the worst models? Why not question the common assumptions of the ensemble when all the contributors fail in the same direction? Why do I even have to ask? You can predict it will generally go downhill, and if you see a big rock in it’s path you can be reasonably confident that it will hit it and bounce off, but you can’t predict the size and direction of all the little bounces in between. The argument is "big is predictable, small is not". This is hocus pocus non-science. In 1/f noise both the big rocks and little rocks are all part of the same noise. So if the small is unpredictable then so is the big. "I completely agree that you cannot foretell the future, this is entirely my point. However, you can make estimates of future changes if the thing you are studying is following physical laws (which the climate system does, but horse races don't)." So you don't believe horse racing, follow the physical laws? Mmnn? What laws do they follow? I think the key point is more about whether the current changes are unusual at global scales rather than in any one individual place. But yes, I'd be very happy to discuss next time you're in the Met Office library - when you plan to come, drop me an email to check I'm around, or email/phone the customer centre and they can pass on a message. Thanks for that. Will drop you a line next time I'm expecting to be in. Several of your colleagues believe The CET area to be a good but not perfect proxy for the northern hemisphere and possibly the globe. I think the former likely but am more sceptical of the latter. If even the former, it provides a ueful idea as to temperature tendancies and likely weather events. Nothing like a climastrologist on an exciting adventure ride. I am unable to understand one of the minor jokes though; the little man poking his head out of the grounded balloon. Just who or what is 'Callendar'? "...It’s a bit like watching a ball bouncing down a rocky hillside. You can predict some aspects of it behaviour but not others..."
An analogy for the ages? Since GCM's are supposed to research climate, that means your bouncy ball analogy mimic climate? While that does resemble touted GCMs it certainly is not a starting point for Climate. Future climate is unpredictable, without the comfort of assumptions that is obvious to anyone listening or reading year after year of failed climate predictions and doom prognostications from the GCM owners.